Union Minister of Agriculture and Farmers’ Welfare Shri Radha Mohan Singh met his Nepalese counterpart Mr. Chakra Pani Khanal, Minister for Agriculture, Land Management and Cooperatives in New Delhi and assured him of India’s support to further Nepal’s agriculture sector. Shri Singh said both countries are largely agrarian and agriculture has been identified by the two sides as an important area of bilateral cooperation for which we are committed to support Nepal. In the inaugural Ministerial meeting of India-Nepal “New Partnership in Agriculture”, the two Ministers discussed ways to strengthen cooperation in the agriculture sector such as agricultural research and education, arrangement for supply of fertilizers, mutual recognition of inspection, testing and certification system, trade facilitation measures, strengthening livestock services, veterinary research and development facilities, and promoting exchanges between the India Council for Agricultural Research (ICAR) and the Nepal Agricultural Research Council (NARC). The Agriculture Minister also expressed happiness that a pilot project on organic farming and soil health for implementation by India in Nepal has also been finalized. Shri Singh further added that India will be happy to share with Nepal its experiences in implementing new initiatives for enhancing agricultural productivity and welfare of farmers. Initiatives like Soil Health Card, Pradhan Mantri Fasal Bima Yojna, eNAM, Pradhan Mantri Krishi Sinchayee Yojna etc. have been yielding positive results, he said, expressing hope that the visiting delegation gained fruitful knowledge that will help improve the respective areas of agriculture and allied sectors in Nepal. Mr. Chakra Pani Khanal, Minister for Agriculture, Land Management and Cooperatives, Nepal, who is on a five day visit from June 19-23, 2018, will visit Indian Agricultural Research Institute, Pusa and National Centre of Organic Farming, Ghaziabad. On Mr. Khanal’s invitation, Union Agriculture Minister, Shri Radha Mohan Singh will visit Nepal for the next “New Partnership in Agriculture” meeting. 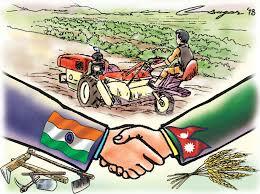 The Prime Ministers of India and Nepal had launched the “New Partnership in Agriculture” on April 7, 2018 to increase bilateral cooperation in agricultural sector for the benefit of farmers of both the nations.